I honestly don’t know where to begin with this movie. On the one hand you have a sweeping/over the top action film that is bursting with imagination. On the other hand, you have a plodding vaguely Darwinistic environmental tale that starts nowhere and ends with a wisp of blah. 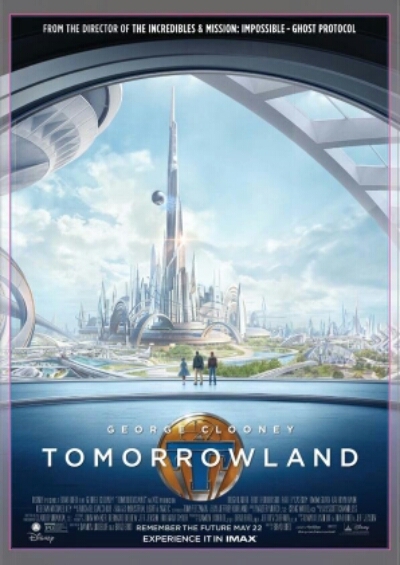 Such is the story of Tomorrowland, two movies in one. Neither of which fully work. Let’s begin with what does work: Tomorrowland is one of the most imaginative and beautifully realized films I’ve seen in a while. The effects, the design, and even the staging of the multiple fights scenes are impecable. Director Brad Bird uses his Pixar roots to the fullest as he creates a magical world. Sadly, he wasn’t able to translate that magic to the script he co-wrote with Damon Lindeloff. The story isn’t just boring- although it is- it’s unispired, insipid, soulless, and so pedestrian you have to wonder how the hell it even got made now. It’s narratively sub-Nickelodeon sitcom. Structurally, this is 3 movies. The 50s, The present, and Tomorrowland. Each section falls apart in it’s own way. Our past story because we are thrown into the scene with no connection and no characters to root for. Who is this kid, and why do we care what is happening? It’s all poorly established by these weird interstisial “expository” scenes featuring George Clooney and Britt Robertson, our main characters. This past section explains, parts of, Clooney’s backstory as a child genius. We then switch to Robertson’s story, a modern child genius — at least we’re told, we never really see her do anything particularly amazing – who seems to mostly be concerned with saving the world (remember that for later) and keeping her dad (Tim McGraw) employed with NASA. Robertson plays her role with a wide eyed entusiasm that is hard not to like but she is also somehow just bland enough that you don’t care. The third section is of course the titular alternate universe filled with amazing technology, sleek architecture, and basically nothing else. In fact the Tomorrowland scenes really are a micrososm of all that is wrong with this film: grand visuals with nothing beneath it. And, when these dissparate stories converge, we are treated to a type of violence that is shocking for a Disney movie and a plot that soars to amazing heights before very quickly crashing into a dumb “message” and fizzling out in a predictable and uninteresting way. Tomorrowland has so many problems, but the worst is its shoehorning of a message at the 11th hour. While it is abstractly hinted at throughout, it’s easy to hope that the imaginations that have come up with the spectacular visuals you’ve seen will come up with a better ending than a watered down Avatar clone. Also, the criminal undersue of McGraw, who’s character is a NASA engineer, is baffling. Especially because his teenage daughter runs away to another state/another dimension and he doesn’t seem so bothered by it. Bad chacterization and terrible story logic.